WHAT IS ASTROLOGY AND WHAT IS A HOROSCOPE? 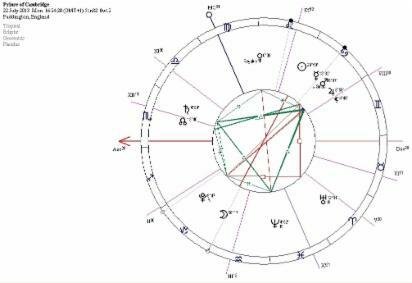 The new prince born 2018 is capturing everyone's hearts, but here is an interpetation of his big sister's and borther's chart to demonstrate what can be learned from a basic natal reading. The new prince fulfils my 2013 prediction of further siblings for Prince George. Read Prince of Cambridge birth chart below the Vedic chart reading of his baby sister the Princess Cambridge. Follow the link below to my Leeds astrological mundane chart reading, published on BBC website. Astrology is the study of certain significant planets and celestial points and their movements throughout twelve constellations encircling the centre of earth. As these planets travel around the constellations, astrologers throughout the ages have observed what effects their movements have on earthly events. An astrologer studies the patterns the planets make as they continue on their journey and interprets these signs and the message they are sending, similarly to the way we read and interpret Egyptian hieroglyphs, or our own alphabet. An astrologer is trained to write then read the astrological data written in the horoscope and translate the messages of the signs and symbols and interpret their meaning for the person they belong to. A horoscope is cast for the exact time, date and place of birth. When this is interpreted it tells the story of your life. So, just as a child learns to read and write what a story says by learning to decode the letters and patterns of the alphabet, and text and patterns print makes on the page, so an astrologer learns to read the heavens above at your birth, write down the signs and symbols in the form of a horoscope, then read what these are saying to unfold the story of your life. A basic chart set up before planetary positions are drawn upon it. A fuller chart is then calculated which an expert astrologer is able to analyse and read fully. Below are example chart readings one a vedic reading for Princess Cambridge followed by the Prince George's chart reading. The new royal baby is a beautiful girl who will grow into a fabulous butterfly always wanting to be on the move. Her chart shows special royal beauty birth marks on the right chest area with a beautiful mole on the left side of her face, another one, possibly two on the left side of her head that single out her cosmic individuality as the planets leave their mark from birth. She will need to take extra care with head knocks and bruises she will be vulnerable to. Her older brother is tellingly the leader who will always dominate proceedings in her life, but that is only to be expected, but this will allow her the privacy and retreat position from which her shy nature can operate more favourably away from the public eye. She will undoubtedly increasingly develop some leadership qualities herself however, and Prince George may need to duck her fiery nature when tempers flare now and again. She is a very tactile child who will need beautiful surrounds to help her connect with the harmonious side of life when she needs to relax and unwind and for sure her baby rooms will already be adorned with magazine style opulence and luxuries any royal princess would expect to greet her when she wakes. She will love music and I expect lots of lullabies will already be serenading her to keep her calm and comforted and these will feed her innate ability for singing and producing music herself later, as well as nurturing her creative and artistic talents. She is very much her mother's daughter with a powerful connection that will see many ups and downs but will always remain a strong bond and they will travel frequently together. Vedic astrology gives her an exalted Jupiter in her second house of family and finance and this tells us what we know already, and that is she comes from a good noble heritage, with religious convictions, allied to the ''movers and shakers' of those who run society. It also tells us of the wealth and many fabulous possessions coming her way throughout life. She will make an excellent student when she starts school and probably excel at learning in her early years, though progress will be interrupted this will not hinder her ability to soak up important knowledge that will be useful for her later in life. She has a wonderful sense of humour so I expect fun and games will offset the turbulence and sobriety of regal life, bringing much mirth and merriment to the royal palaces. The princess will not be a pushover once she finds her feet in life, she will be confident and in maturity will be known for her rather unorthodox and unusual views and perhaps a rebellious streak that makes her a very interesting, at times unpredictable individual who doesn't always conform to traditional dictate, though she will have a strong respect for it. I expect her to marry a distant relative eventually, but let's not spoil the wonderful magic of a new life unfolding its beauty and surprises too early. Though it is likely a younger brother may keep her very busy...........this little girl is an extremely wise old soul born with inner wisdom and deep self knowledge. She will command respect naturally, and woe betide anyone who imagines they can pull the wool over her eyes, she will always defeat opposition but will always use truth, justice and fair play, each of which are essentially her own inner traits.. Welcome wise one to the world. The tropical astrological chart of Prince of Cambridge first broadcast 23rd July 2013 on local BBC radio. The Duchess of Cambridge gave birth to a little baby boy on 22nd July at 16:24 BST at Paddington hospital where both Prince Harry and Prince William, his father, were born. The Duke and Duchess are destined to gain a lifetime of happiness, joy and humour from this baby who brings a lovely Jupiterian influence to bear upon both their Sun and Moon positions showing a sharing of humour, a liking for good fun along with a positive outlook and much hope and joy for the future. The baby boy is born with the Sun just within Cancer and this gives him some of the shyness of Prince William who we have often seen blush now and again, a trait his son and heir will inherit. The boy will be kind and caring and strongly family oriented, deriving strength and support from the ties that bind relatives together. He has a Scorpio ascendant which gives him a passionate and intense nature with a need to get to the bottom of things but a talent for confidentiality showing a great talent for ensuring that any secrets he is privy to are always dealt with in a gracious and thoughtful way. So I don't expect he will take on the unusual but infamous humour of the Duke of Edinburgh, but he can deliver a few hilarious comments now and again that create mirth and laughter that cuts through the pomp and circumstance of royal rigidity. He will like telling jokes too, just like his great grandfather, but I expect him to excel at playing practical pranks too, so watch out at the palace! The new heir to the throne will have an adventurous if not impulsive streak too with an excitable temperament, and he will travel extensively, but there is a hint he is accident prone too so I would urge extra care in teaching him the value of good planning and personal safety in tricky situations. He can be a passionate and intense personality who likes to get things done quickly and in his haste could cut corners that leave him ignoring safeguards on his health. I fully expect that in his childhood he will collect quite a few of the usual cuts and bruises as a result of rashness due to a Mercurial need for speed that overtakes sensibility. He has good leadership ability as well, and will demonstrate this increasingly after age twelve. The Prince of Cambridge has no less than four planets in Cancer giving him a keen instinct for family tradition and family values, but Mars being one of those planets he can also be a little bit of a rebel as years go by and I'm sure in his teenage years he'll raise a few eyebrows with a little rebel rousing, a bit like his uncle Harry. Like his uncle Harry and father he has a love of regimental routine and will enjoy the pomp and circumstance of royal parades and celebrations. He will love dressing up in uniform, just like his father and uncle did as children, and as well as wearing the usual royal paraphernalia it is likely he will eventually wear a military uniform as well, auguring a potential for him following in his father's footsteps and taking up a position in our royal services. He has Venus in Virgo the sign of service and this gives him a capacity got hard work and attention to detail. Hewill take much satisfaction and pleasure in carrying out his royal duties and following strict regimented routines we know our royal family have to abide by in carrying out the heavy workload of royal duty. His sense of duty is very overt and he will work extra hard to bring about benefits for the general good and welfare of all. With Venus near his tenth house I expect him to be much loved and have an affection for his public office and the people he meets whilst conducting royal affairs. It goes without saying he will have a global celebrity status but this will be a natural part of his daily routine that I think he will enjoy, thankfully. He will have natural grace, magnetic charm and good manners and we will see him growing into a very courteous child with consideration for others in his public life. He will develop a strong belief in his own capability to create a better future for all, and this is centred in a deep philosophical conviction and moral code passed onto to him by both parents. There is a lovely connection between his Jupiter and the Sun and Moon of both parents ensuring he brings them much joy, endless hours of amusement, extending their own understanding of life and the universe and a wonderful sense of hope optimism and belief for the future. A baby sister is likely and I wouldn't be surprised if a baby brother or two also arrived later to complete the family. He is destined to have a large extended family, and we see the signs of this already evident, and we can expect many headlines to come about the fun and games as well as the ups and downs of his family life. As for Leeds folk this is a special time for the city due to the heir to the throne having strong links with its founder members and key dignitary of the city, so how significant that Prince Charles, the grandfather of this child was travelling within the city at the exact time of birth of his grandchild! A good time to celebrate for all of us. Not only that but the natal Sun in the baby's chart is positively conjoined with the Sun in the Leeds city chart reflecting this link between the city of Leeds and royal tradition. His Sun is posited amazingly on the midheaven of our city chart reinforcing his royal links to Leeds. I expect the Prince of Cambridge to talk of this link himself due to his Mercury also being close to the Mercury position in the Leeds City chart, so perhaps he will be interested in the commercial interests of this city and foster similar interests in it to those of his maternal ancestors who were businessmen here and played out a great role in the growth of the region. Finally. Planet Venus tells us something very special about this baby who has a unique placement of the planet on top of the bright star Regulus, the brightest star in the constellation Leo. As we all know the lion is king of the jungle, Leo is the sign always associated with royal affairs, a sign that this boy will grow up to be someone special in our royal tradition. We have all heard of the leonine Great Sphynx of Giza in Egypt and its links with the traditions of the fabulous Pharoahs, it mirrors the position of Regulus in the sky due to its placement on the ground facing the Great Pyramid at Giza aligned with the constellation Orion, and the Milky Way which reflects beliefs of it being the passage into the afterlife of royal rulers. For Egyptians the lion was guardian of the underworld and was associated with guarding the Duat, the pathway to heaven and the afterlife, with ancient priests incorporating it into their solar observances considered sacred by the priesthood and Phaorahs. Regulus is at the foot of the constellation Leo which bows down on its knees before Orion and the Milky Way, or Duat in the heavens, as if in homage to all kings and royal rulers that have passed that way before. With the new heir to the throne having Venus so close to this very bright star, could this be a sign that our heir to the throne is going to be as fabulous as Pharoahs, if not more so than even they were in all their glory, leaving a lasting legacy of continued royal tradition for this nation?